Does anyone else feel like life is just flying by at the speed of light these days? I swear that it seems we were just beginning our summer vacation minutes ago … yet now we are already thinking about winter break, the holidays are just about here, and the whole hustle and bustle thing is about to start full-force. How did this happened?? I must have blinked for a second too long or something. But, I think it is high time to slow down and enjoy all of the little moments. I am trying really hard to say “no” to a lot of things this season so that I do not feel like the holidays are over before they even start. This is my favorite time of year and I want to enjoy it without missing all the special experiences. Do you want to slow down with me? Maybe this we way, we won’t all wear our immune systems out and end up sick for much of the winter. All this rush and fuss can wear us down and then sometimes our bodies have a funny way of telling us we need to take a break… by getting sick. 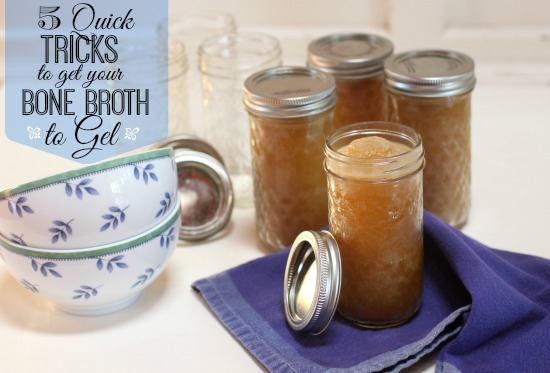 In case those germs do get the best of you though ….you may want to keep some bone broth stashed away in your freezer. I usually make a big batch and then freeze it in 10-12 ounce portions in these 12-ounce quilted mason jars. They work awesome and are a perfect portion to just pull out a couple at a time for a recipe, for a pot of soup, or just to drink straight from a mug. You can go and read all about the INCREDIBLE BENEFITS of properly made BONE BROTH… but here are some magic tips I have learned that will also help you get that liquid gold to gel when it is cooled. Before I give you those tips, please note that even if your broth does not gel every time, it STILL holds INCREDIBLE health benefits. 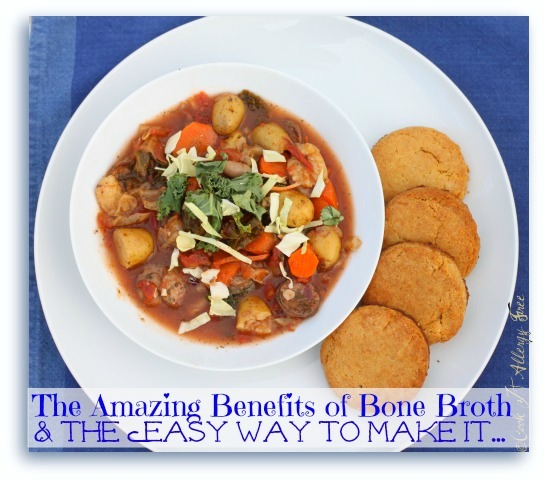 But there are just some added benefits of gelatin in bone broth: Gelatin is considered healing and coating to the stomach and the digestive tract, perfect for those dealing with gastro-intestinal disorders. It is also useful in hypo- and hyper- stomach acid issues. It supports skin, hair, and nail growth, and it is full of amino acids as well. It is helpful for joint recovery and has even been rumored to improve cellulite. Over the years, I figured out some simple tricks that finally yield a perfectly gelled batch of bone broth just about every time. They seem like minor details, but these easy tricks somehow really seem to make all the difference…. Do not use too much water. Use just enough to cover the bones.This may seem counter-intuitive since, obviously, the more water you use, the more broth you’ll end up with. But, the less water you use, the more dense and rich (and gelled) your broth will become. Use LOTS of good quality bones from a good source. I usually order my chickens from a local pastured organic farm here. There may likely be one in your area so do some research. And then STUFF that pot with as many of those quality bones as you can. Use those chicken feet... I know. Gross. But, I tell ya, they work, folks. They really do produce some of the best gelled broths. You can read here more about why… If you can’t stomach the idea of the feet though make sure to use some of the backs of the chickens. Use a lid…but leave a crack on the side for that steam to escape so that it does not just condense on the lid and drip back in to the broth and dilute it. Don’t let it boil. Only let it simmer… meaning, keep it so that only a few bubbles are coming to the surface at a time. Allowing it to boil for all of those hours of cooking will break down the collagen too much and will prevent it from yielding that gel factor. SO..now that you have all of that wonderfully gelled broth, what on earth do you do with it to use it up? Easy: Use it as the liquid instead of water as you make your rice, use it as part of the liquid as you make pasta, add it to your sauces, and of course use it in ALL of your soups, stews, and braises, and my FAVORITE way is to simmer a couple of cups of it on the stove with a hunk of fresh ginger and fresh garlic and then strain and drink STRAIGHT FROM A MUG… yummo. 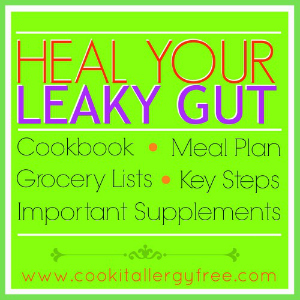 If you are looking for additional ways to boost your immune system and to heal your gut, you can find recipes, meal plans, grocery lists, and supplement suggestions HERE! The BEST tips!! I have had problems with this myself, although I still think “liquid” broth is super healthy. 🙂 I think my problem is a high water to bone ratio. Thanks for the tips, Kim! I always have some broth in my freezer. I use my left-over rotisserie chickens. Do you think pre-cooked bones have less of the good stuff in them? When I make broth from raw bones I usually roast them first. I think the vinegar helps it gel too. I too am addicted to real bone broth and how good it is for our bodies. My tiny freezer has some stacked in there now. I sometimes use it as a marinade that then cooks into a sauce. I mix it into a stir fry and I use some when making something like french onion dip. You know back in the day you might use one of those dry packets? Well they had dried stock in them so when making my dip I add it to the onions when they cook and it gives that dip a real depth of flavor. Just made my first bone broth for Pete and the kids. These are good tips, thanks for sharing Kim. Callum loved it which made me very happy!!!! Oh, and GREAT tip on using smaller jars. I always throw it into one big one and then have a big frozen chunk of broth that I have to deal with. Super idea. You are a goddess Kim! I NEEDED these tips! They all make sense too, as to why sometimes my bone broth is excellent and other times, meh, without any gelling.